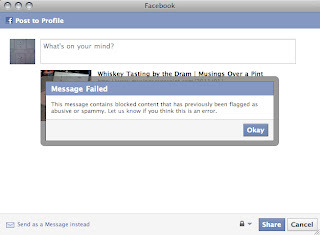 Musings Over a Barrel: These Musings Banned on Facebook! Almost since the beginnings of "Musings Over a Pint" I've been sharing the posts on my Facebook account. Yesterday, when I tried to share on Facebook the previous blog entry I was informed that this site has been reported as containing "content that is abusive or spammy" and is now banned from being linked to on Facebook. In recent months I've been occasionally sharing my thoughts on my faith, politics, self-defense, in addition to my musings on craft beer. These things are as much a part of who I am as my love of craft beer. I realized that I might lose some readers. But what I didn't count on was the anonymous repressive actions of someone who disagreed with my opinions. The ban applies to all of musingsoverapint.com, not a specific post. It seems there is someone who prefers to take cowardly actions against any opinions with which they don't agree, rather than contacting me directly. Of course, that only serves to prove they have no valid argument against my beliefs and that their only defense is to block others from reading them. Our forum should be one where differing opinions are treated with respect - disagreement is taken directly to the author, not sneaking in silently and unjustly cutting off the ability to post that which interests ME because it is not the same as YOUR opinion! I left out "who want to tell others what they can and cannot read" when I wrote that list. 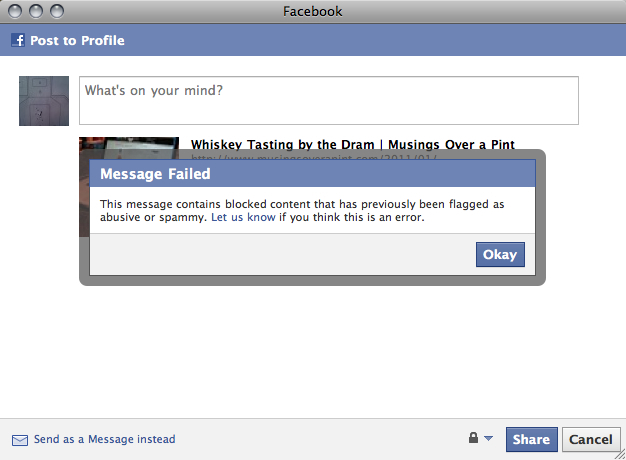 Just as disappointing is Facebook's blind acceptance of what is reported as "abusive." On Facebook founder Mark Zuckerburg's own Facebook page he lists his interests as "openness, making things that help people connect and share what's important to them, revolutions, information flow, minimalism". Apparently that "openess" only applies to topics that Facebook elite deem appropriate. Currently this filter is only in place for automatic posting using the Networked Blogs application, and for sharing via a "Share This On Facebook" button or link, both of which examine the content before posting. For the time being, I've found a way around Facebook's opinion filters, so I'll get some posts up despite the ban. I may vehemently disagree with you on matters other than beer, but I will vehemently defend your right to say these things, post them, blog them, write them. Let me know if there's anything I can do or to whom to write. Below each post there's a Share to Facebook button. Click it and then click "Share" on the window that pops up. (See the photo above.) You can use the "Let us know" link to fill out a form for FB. Thanks to all who offered to help. I just posted a link to your "Blessings of Beer' post with no problem. Did Facebook change something? Anson, sometime in the past hour, Facebook removed the "abusive" flag. See the top post.